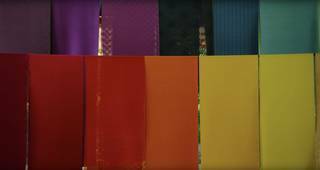 This display explores the work of Kyoto's celebrated Somenotsukasa Yoshioka dye workshop. It is complemented by four short documentary films. Master of colour Sachio Yoshioka succeeded as fifth-generation head of Kyoto’s Somenotsukasa Yoshioka dye workshop in 1988. The workshop uses only plants and other natural materials to produce a wide range of extremely beautiful colours. Yoshioka has been especially active in reviving ‘forgotten’ colours like those found on textiles preserved in the 8th-century Shosoin Imperial Repository in Nara. We are also showing four short documentary films exploring this fascinating world taken in 8K UHD – the first use of this state-of-the-art technology in a UK museum.